J. Edgar Hoover: John Dillinger held up a bank for $74,000 while you failed to arrest Nelson. Melvin Purvis: Sir, I take full responsibility. And I would like to make a request. That we transfer men with special qualifications to augment the staff here in Chicago. There are some former Texas and Oklahoma lawmen currently with the Bureau in Dallas. J. Edgar Hoover: I thought you understood what I'm building. A modern force of professional young men of the best sort. Melvin Purvis: I'm afraid our type cannot get the job done. J. Edgar Hoover: Excuse me, I cannot hear you. My grandpa's first reaction when he heard this movie was being released was -why? Why yet another movie about Dillinger? What can it add? My grandpa's question triggered my thinking. Movies and Hollywood filmmakers don't seem to care anymore about adding something to history or the medium. They just seem to compulsively adapt other movies, toy lines or videogames into modern reworkings. It's a culture of thoughtless recycling. Fortunately, and although I haven't seen the '30s or '70s biopics, Michael Mann does have something to show. The first surprise is how the movie is shot. As one of the most vocal followers of digital video, Mann seems to exploit its handicaps instead of trying to convince us it can look as good as film. Throughout the movie we're treated to 3D video feel, artificial grain and close-ups which show up every pore on the actors skins. It's like someone sent a documentary crew back in time. However, this incongruous approach also made me experience the 1930s in a way I'd never done before, as a reality instead of a postcard. Almost all movie depictions of the "public enemies" era (even the gritty ones, like Bonnie and Clyde) are stylish and sophisticated. Instead, Mann's compulsive attention to prop and costume detail combined with the hand-held camera-work are immediately urging and attention-grabbing. Mann, as a filmmaker, always seemed to me more interested in technique than depth or story. This is arguably the same film he has made twice before (I'm talking about Thief and Heat), only this time history-based. As I read on about Dillinger and Melvin Purvis after watching the film, I realized the movie's script is very unusual in that it almost seems to strip the juicy bits out of the story. Where is the scene with the people soaking their handkerchiefs on Dillinger's blood, or the '30s era depression portrait? Like you guys were saying, Little Bohemia was in fact an embarrassment to the FBI in which civilians got shot and the criminal walked away unharmed. 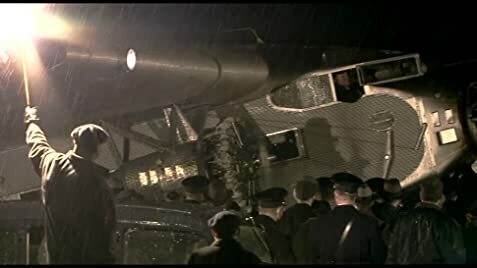 Except for a weird scene in which Dillinger walks into the Chicago police station and wanders around, there's a very down-to-earth approach to the character, taking away his more mythical elements and leaving us with a career robber who, like James Caan's character in Thief, seems to abstractly decide to fall in love to make up for lost time. The movie focuses obsessively on this relationship, instead of the more obvious paths it could have taken. Hoover's incompetence and his closet homosexuality are brief side notes. So is Melvin Purvis. The movie strips him of a personality, showing only the professional side of the policeman. This is so evident that when the title card near the end informs us that he later shot himself, I had to laugh it was so random. I seem to be speaking against all of this, but in fact what I'm doing is pointing out how unusual all of these directorial choices are. In fact, I celebrate them. 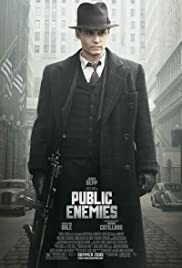 Public Enemies is a movie that might seem frustrating to many, but to me, it was a refreshing, exciting journey into a world too often depicted and too easily neutralized. It's a great thing to see a copmen-and-robbers film without feeling like I've seen it all before. And make no mistake, the film's action scenes are intense. I'd like to finish by pointing out that the movie has a hell of a cast. Johnny Depp is a revelation in a time when it looked like his awesomeness was exhausting itself. Christian Bale is not given much to do as Purvis, but he's competent, mostly the Bale serious face we see too much of all the time. Billy Crudup's Hoover is great, he deserves his own flick. Marion Cotillard is a great foil to Depp. There are a lot of very famous faces on the film (in fact, maybe too many), and some of them are only in for very brief seconds - Lily Tomlin, Giovanni Ribisi and Leelee Sobieski enter and leave the screen and they're all very good, but none have any big scenes. This might be the artsiest blockbuster I've ever seen. Which, in my mind, is a compliment.